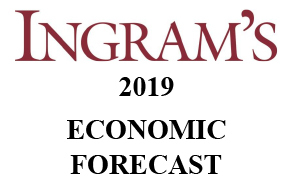 Ingram's :: 2019 Economic Forecast: Are We Hitting the Brakes? A tad, perhaps: There are valid reasons for recent volatility in equities markets. But economists are paying greater attention to fundamentals that could keep the expansion going for another year—or more. The good news, for anyone spooked by the 4,000-point drop in the Dow Jones Industrial Average between Dec. 1 and Christmas Eve, is that the market is a leading indicator—it is not a leading guarantor. For all the chin-stroking predictions of impeding doom vomited out by the 24/7 financial media throughout December, economists and wealth managers at the dawn of 2019 are generally confident that the sky is not falling, and probably won’t through the rest of the year. And even into 2020, their expectations are that if—if—there is a recession, it will be brief and shallow. The U.S. economy, it seems, isn’t taking many cues from cable news. Exhibit A: As January rolled in, the Labor Department reported that more than 312,000 people found jobs in December—close to 75 percent more than had been projected. Moreover, 2018 produced the best job growth in more than a decade, topping 3 million. The manufacturing sector, long held out (erroneously) as fading component of the economy, accounted for more than 10 percent of that gain, raising its 2018 job-creation output to nearly 285,000, a 37-percent increase over 2017 levels. Further, the National Feder-ation of Independent Business issued a December update on its Small Business Optimism Index, showing near-record levels of enthusiasm. That update also showed that 24 percent of companies still plan to raise wages, off slightly from November’s reading, which was the highest since 1989. Core inflation remains at 2.2 percent, roughly where the Federal Reserve wants it capped, and inflation overall is being held in check by a powerful downdraft in energy prices. Before recovering earlier this month, oil prices fell below $45 a barrel, rivaling the trough hit in the mid-1980s when adjusted for inflation. The Fed itself helped fuel the Jan. 4 record rise in the Dow, a pop of nearly 750 points, when chairman Jerome Powell indicated that the board might be more flexible this year after steadily increasing interest rates the past three years as the economy took off. For investors whiplashed by market volatility that wiped out much of 2018’s equities gains, and for business owners attempting to adjust their bearings in a new year, there are plenty of indicators that say “sit tight.” The economy this year may have its potential pitfalls and perils, but that’s not to suggest we’re on the cusp of the next recession. Constraints on capacity aren’t as great this time around, he said, whereas “in the past, those would have caused inflation, which causes the Fed to step in, raise rates, and choke off growth and expansion sooner. So we can have a much longer cycle, and it’s playing out that way now. So it is different. For now, we don’t see that slowing any time soon.” Navigating investment waters at this point in the cycle entails some once-in-a-career challenges for wealth managers. For starters, 10-year expansions are normal, even if this one had a hard time qualifying as an “expansion” from the Great Recession’s end in 2009 through about 2012. Scott Boswell of Commerce Trust Co. also falls into the “more to come” camp. Making this cycle hard to judge is the length of the expansion; economists generally know a change is coming after such a long run-up. But this one was different, he said, because the run-up didn’t start when recoveries typically do—it was years in the making. Technically, we were recovering in 2010 and 2011, but you’ll have a hard time finding anyone in construction, development or housing who would agree with that assessment. The challenges that are most evident, he said, include uncertainties over what will happen with President Trump’s aggressive trade posture, how China will react to it, and what will happen with interest rates. But in each case, he suggested, the challenges aren’t insurmountable, and the impact on investors is likely to be minimal if they are correctly positioned with asset allocation and if they stick with the long-term investment goals. Following the December downturn in equities, Mathews sees a market preparing to spawn opportunities for investors. “We’re trying to be opportunistic,” he said. “You look at some of the sectors that have been beaten down, tech is one, where they probably got a little over the tips of their skis, overextended, then oversold.” Rather than looking at sectors, he said, investors may do well to look at names of established companies trading at multiples of 15 times earnings, and in some cases, as low as 10 times. “It’s a good time to buy, and that’s an opportunity we’ve been looking for. Six months ago, there were not opportunities like that; today, there are.” Torres says investors need to keep in mind that while the market is forward-looking, it’s not infallible. Sometimes, it sees recessions approaching when none are near.